Explain what a Trail Crew is. Demonstrate how to navigate Vetforce community features. Identify the resources offered when you’re ready for certification. 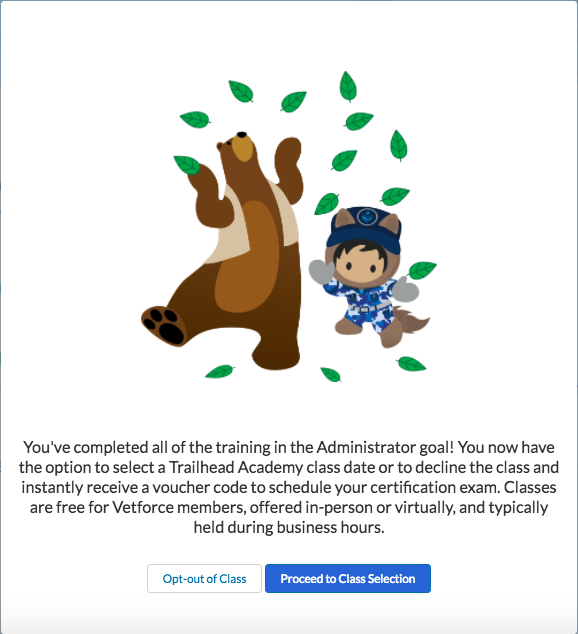 Based on your selected goal and Trailhead rank, you are matched with a group of other Vetforce learners called your Trail Crew. We encourage you to introduce yourself and keep each other accountable while you trek through this journey together. Use the My Feed Snapshot on the Home screen or navigate to the Chatter tab to interact with your Trail Crew. The My Training section of the Home screen includes a list of all of the Trailhead modules to complete toward your career goal. Click these links to access the training modules. You also see an estimated time needed to complete each module. Connecting with other learners is a key part of the Vetforce experience. We offer multiple ways to engage with your Trail Crew and other members of the Vetforce community. Chatter—Use this newsfeed to follow other learners and view their posts, respond to posts, and share your own posts with those who follow you. Groups—Join groups to connect with other learners and discuss specific topics and goals. Vetforce automatically adds you to the appropriate Trail Crew group for your goal. You can also create your own group and invite others to join. Messages—Use Messages to communicate directly with individuals in Vetforce. You can navigate to each of these in the top navigation bar. Ready to start learning? 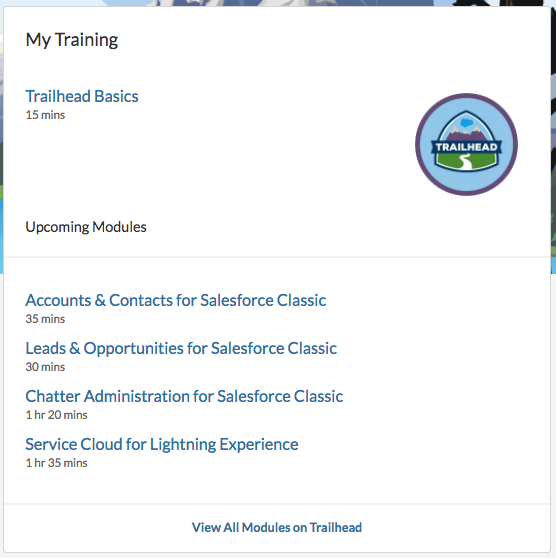 Click Start My Journey to get started and click into specific training modules in Trailhead. After you complete the modules for your goal, it’s time to prepare for the Salesforce certification exam. You can sign up for in-person or virtual classes. Most classes reserve at least two spaces for Vetforce participants. These classes are free for Vetforce members and are typically held during business hours. A link to the Vetforce Exam Prep group to get exam tips from your fellow Vetforce members and alumni. A link to the Salesforce Certification site to download the study guide and exam information. A voucher code that is good for one year, letting you take the certification exam for free. A link to a certification prep knowledge base. Instructions for logging a case with the Salesforce Certification team if you need assistance or have a question about the exam. After you reach your goal and complete the certification, you get the opportunity to select a new goal, which includes free access to training and more advanced certification.